Sooner or later, most travellers in Australia will reach the great cross-roads at the head of Spencer Gulf that is Port Augusta. North is the Stuart Highway to the Northern Territory. West is the Eyre Highway across the Nullarbor to West OZ. East is the Barrier Highway to Broken Hill and New South Wales. And South is to Adelaide and beyond. Many travellers stop overnight either going to or coming from their main destination. But discerning visitors who stay an extra day (or two or three) will be rewarded by discovering some of the FAAAAABULOUS things to do in Port Augusta. Like what? Like THESE! Here’s TEN of my favorites! 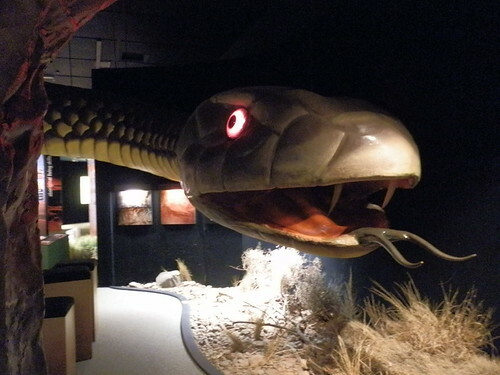 Wadlata Outback Centre isn’t just about tourist information. There’s the excellent gift shop – try a Journey Jottings map or a piece of Indigenous artwork! There’s a cool cafe – try the quandong cheesecake or the quandong slice! And then there’s the time tunnel! Walk into the jaws of the giant ripper lizard and be transported into the prehistoric world of life before man on Gondwanaland. 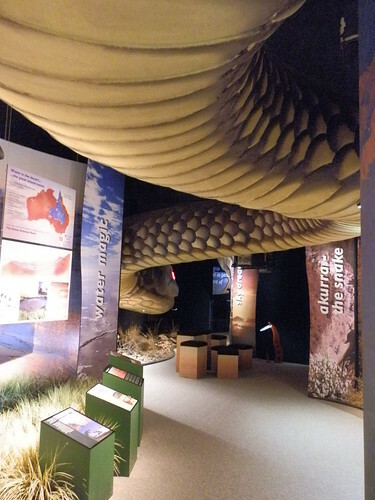 This ancient history lesson is never dull as it moves through aeons (via interactive displays, dreamtime stories and intriguing facts) from the beginning of time to the present day in Port Augusta NOW! While THIS time travel won’t take millions of years, don’t underestimate the time you’ll need – it’s easy to spend several hours there, especially with breaks for lunch and/or morning and/or afternoon tea. Just watching ‘Back of Beyond’, a movie about Outback legend mailman Tom Kruse takes an hour! The good news is if you run out of time on this visit, just pick up a pass-out from the Wadlata staff and come back to finish it off other time! It’s a long way to the top if you want a shocking fall – and the see-through metal mesh staircase doesn’t help either. Luckily for us acrophobics, the Water Tower Lookout’s horribly exposed four flights of stairs ends in a fully enclosed viewing platform complete with wire mesh criss-crossing the view in four directions. Except for a thoughtfully placed hole in the middle just right for a camera lens. But cameras aren’t required to enjoy the superb view of boats, bridges and birds on Spencer Gulf; the iconic silhouette of the power station; and the general landscape filled with parklands and houses that make up this town, named for Augusta Sophia Marryat, wife of South Australia’s first civilian Governor. Is late afternoon leading up to sunset the best time to check it out? I haven’t been there at any other time, so I don’t know – but it sure worked for me! 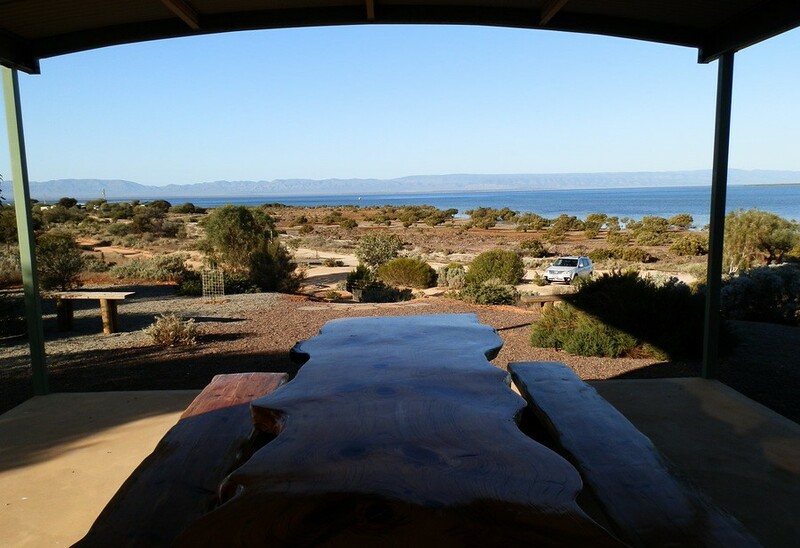 Even if you’re more immune to the promise of RED Cliffs, the Matthew Flinders Lookout – a short walk from the car park – is worth a visit for its staggering vista of Spencer Gulf against the magnificent backdrop of the Flinders Ranges. But throw in a killer sunset and even a coward like me can forget the perils of standing on the edge! 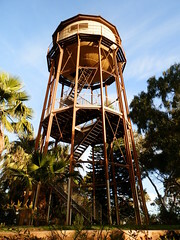 For more than double the fun, take the 4.5 km RED Cliff Circuit Walk from the Arid Lands Botanic Gardens to the Matthew Flinders lookout via a bird hide, a bluebush plain and the railway bridge with fine views from the edge of Spencer Gulf over the RED Cliffs, claypans and mangroves! Follow the loop trail back through the gardens. And if you’ve got a climate with extreme temperatures, lengthy periods of drought and low rainfall, showcase the plants that LOVE arid conditions in your garden! 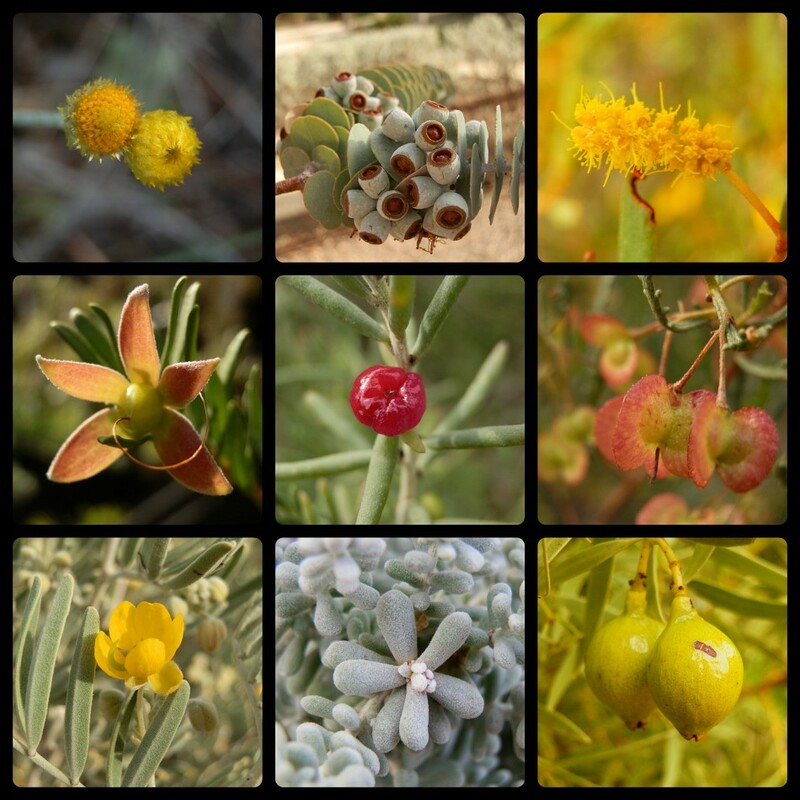 That’s exactly what the Australian Arid Lands Botanic Garden, established in 1993 as an initiative of the Port Augusta Council, has achieved with its arid zone plant habitats – like dunes, desert and saltbush plains – spread over 250 hectares. But demonstrating water-wise gardening techniques isn’t the only attraction! 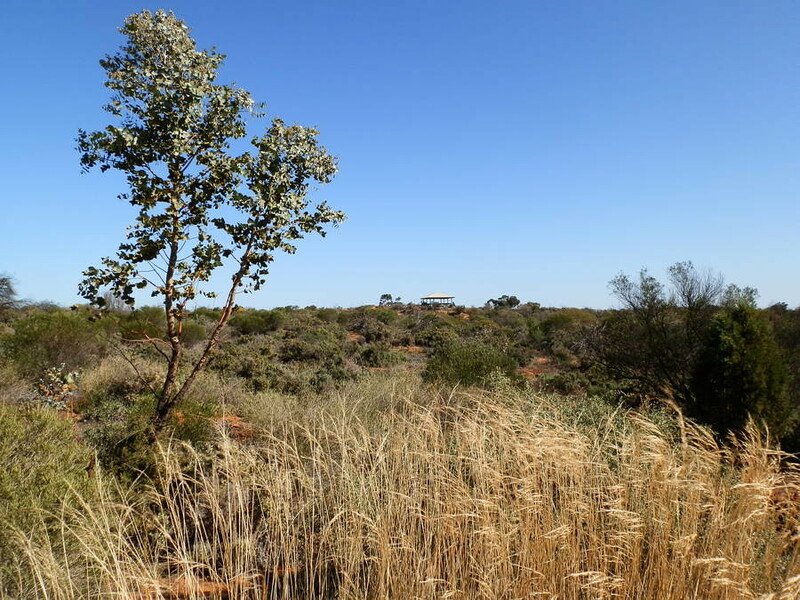 When you’re tired of the walks, bird hides (and over 100 bird species recorded), a nationally significant Eremophila garden, art works, lookouts and plant nursery outside, there’s the Bluebush Café and Gift Shop inside. Entry to the gardens is free, and they’re open all year round (other than Christmas and New Years Day, and Good Friday). Take a trip on a small section of the old Great Northern Railway from Adelaide to Alice Springs, once dubbed the Afghan Express and now affectionately known as the Ghan, through the rocky Pichi Richi pass in fully restored heritage carriages. The Ghan hasn’t passed this way since 1956, but from April to November, experience the magic of steam and take a return trip on the restored Afghan Express from Port Augusta to nearby Quorn (41 km to the north-east); or the Pichi Richi Explorer from Quorn through the pass to Woolshed Flat. 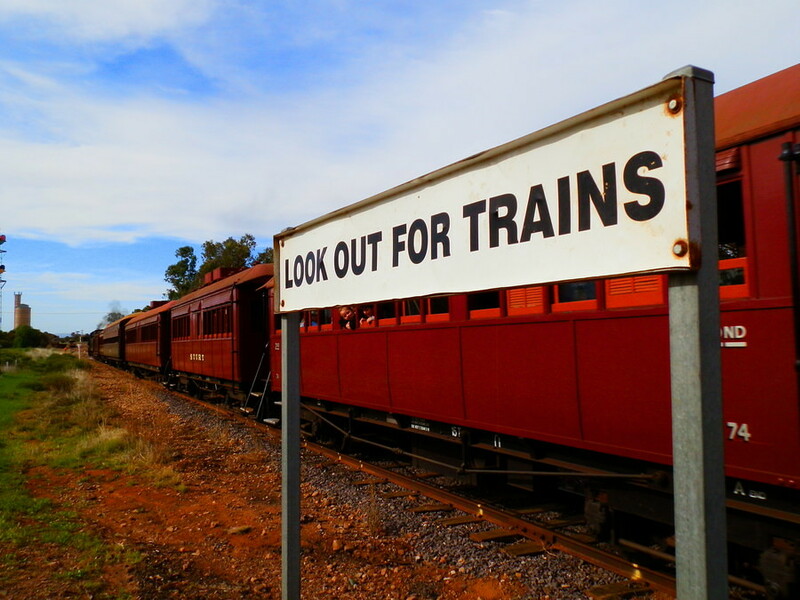 With railway memorabilia at both Port Augusta and Quorn, the railway is a great way to experience the magic of train travel. Railway enthusiasts need not fear having to adopt alternative pursuits like sightseeing, birding and wildflower watching when the Pichi Richi Railway isn’t operating. 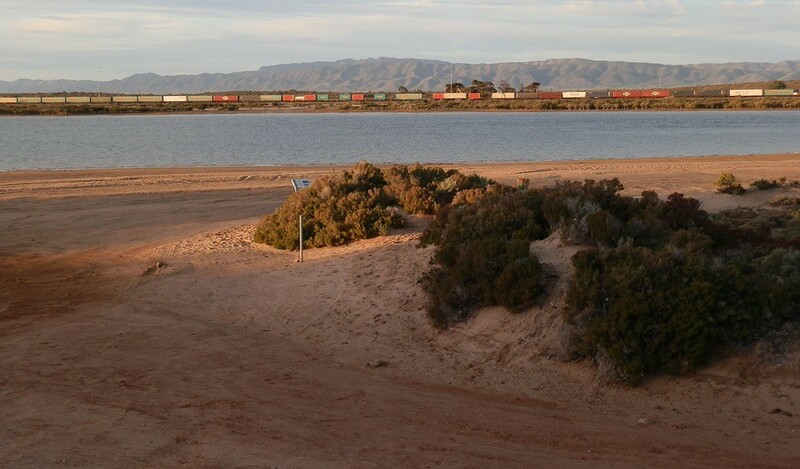 SO … if your preferred lullaby is the soothing sounds of shunting, then find somewhere to stay within sight and sound of the railway because all passenger and freight trains heading north, south, east and west pass through Port Augusta. Is that a TRAIN I see between Spencer Gulf and the Flinders Ranges, Port Augusta? 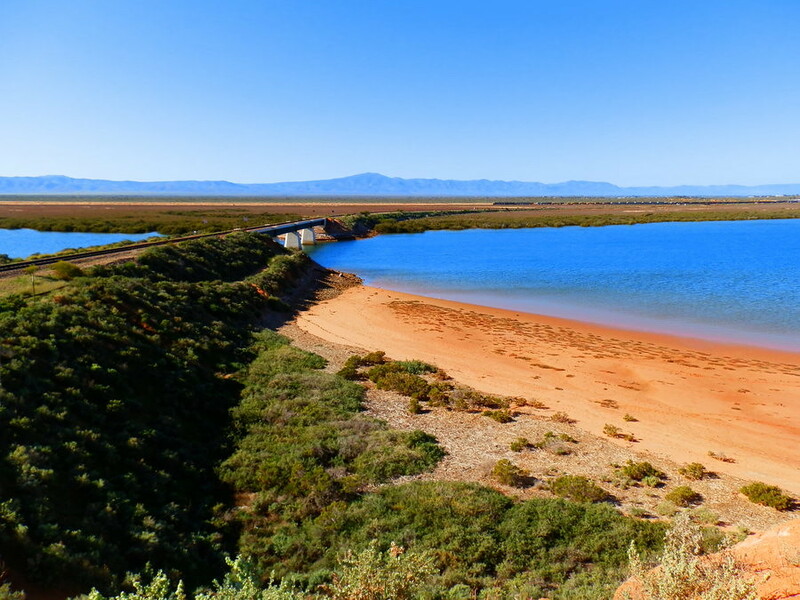 Even Railway ambivalents may find a multi-coloured goods train tracking north along the eastern side of the gulf with the Flinders Ranges a resplendent backdrop an awesome sight. Even without the enticement of a Pichi Richi train ride, the short drive to Quorn is well worth it. And top of MY list of Quorn must-do’s is a visit (or two) to the Quandong Café. Actually, it’s not the cafe. It’s the scones. AWESOME scones. They even beat my own faithfully copied secret recipe pumpkin scones AND give the discerning epicure the opportunity to experience the delights of the Quandong, Australia’s own arid land fruit at its best when turned into a marvellously piquant jam, the perfect accompaniment to THOSE SCONES! When you’re done with that, explore the town’s Galleries, historic buildings, cafés, pubs, an Agricultural Museum and the Powell Gardens botanic garden. If the Quorn scenery looks familiar, it MAY be because scenes from a number of films were shot in the area. Most recently, the region AND the Pichi Richi steam train featured in The Water Diviner with Russell Crowe! Other notable films include Wolf Creek 1 and 2 (2005 and 2013), Tracks (2013), The Shiralee (1986) and Gallipoli (also featuring the Pichi Richi in 1981). I’m not sure if the Quandong Café featured in any of the films – but it should have! 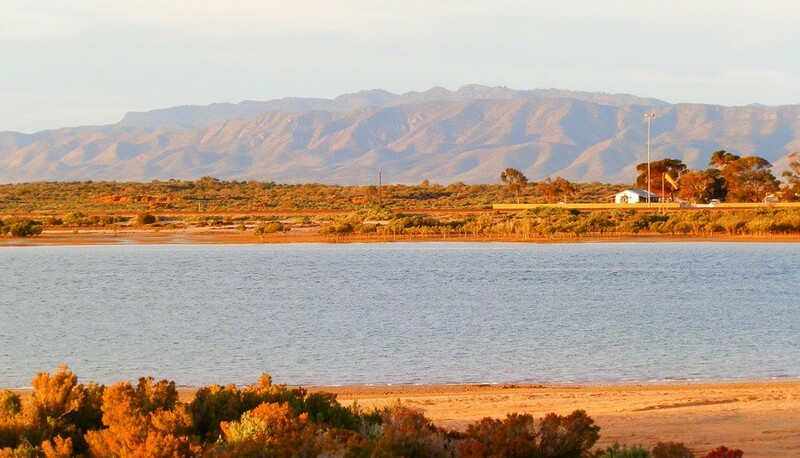 If you want to explore the folds and peaks of the ragged range that makes such an awesome town backdrop, Port Augusta is an easy day trip from some of the Flinders Ranges hot spots. Near Quorn there’s the Dutchmans Stern, Devils Peak and Warren Gorge. 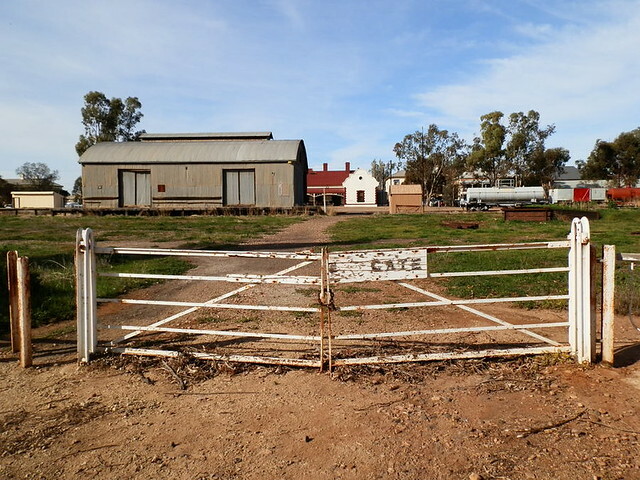 A little further north there’s Kanyaka Historic Site, Death Rock and the Jeff Morgan Gallery at Hawker, 107 km north-east. 67 km south is Melrose, gateway to the Mount Remarkable National Park. 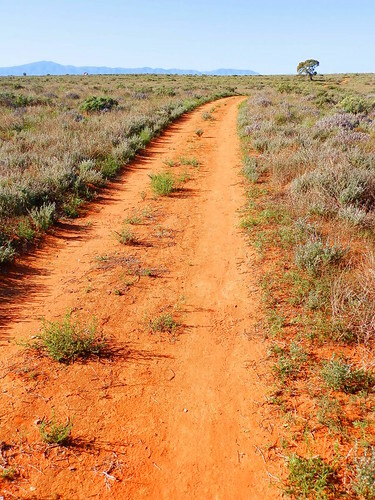 Exploring the Flinders Ranges will take a LOT longer than a weekend – but a Port Augusta day trip makes a good teaser! 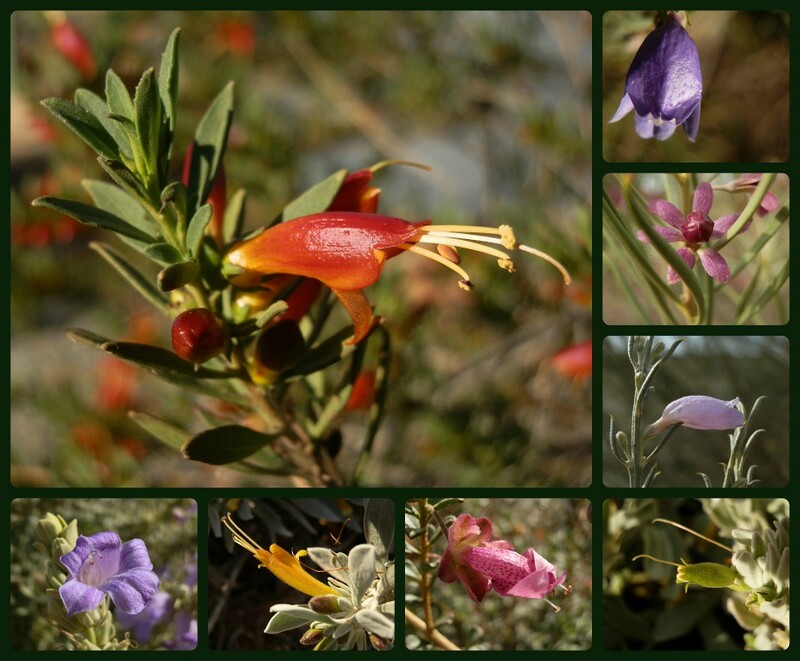 Just in case you didn’t quite catch the beauty of the arid land vegetation, here’s a little taste of what you’re missing! Past the Port Augusta city limits heading south along the western side of Spencer Gulf, the sparsely vegetated dry hills of the outback to the right contrast nicely with the brilliant blue of the sea on the left, and the intriguing skyline of the Flinders Ranges beyond. With a landscape like this, it’s no wonder the gulf is lined with holiday shacks. 23 km later, the gulf widens as the outback sweeps down to the sea at Blanche Harbour in a magnificent sweep of coastline. Atop a low hill above the car park, there’s a marvellous vantage point inside a picnic shelter that tells the story of this place while showing off its natural attractions. But it didn’t always look this good. The ‘before’ photos show what the area looked like 15 years ago, when a group of concerned ‘shackies’ banded together to reverse the ravages of rubbish dumping and off-road vehicle driving. Now, with revegetation well under way and stunning scenery, Blanche Harbour is a place of beauty and peace. So take a look at my TOP TEN – and start planning YOUR stop-over – or weekend getaway – now! And if you can fit all TEN of my favourite things to do in Port Augusta into just ONE weekend, you’re doing well! 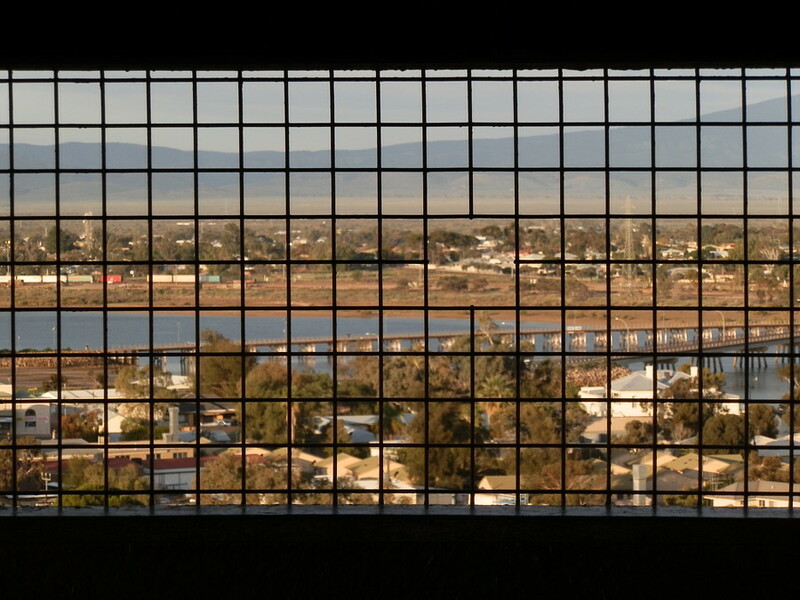 MORE Photos of Port Augusta on FLICKR! PS Did I mention the Scenic Public Loos?? Here’s a triple-toilet-teaser – see if you can find them all when YOU go to Port Augusta! « Darke Peak and the True Blue Two Loo View! Wow! Sounds like you need a train hit real soon, Lydia! 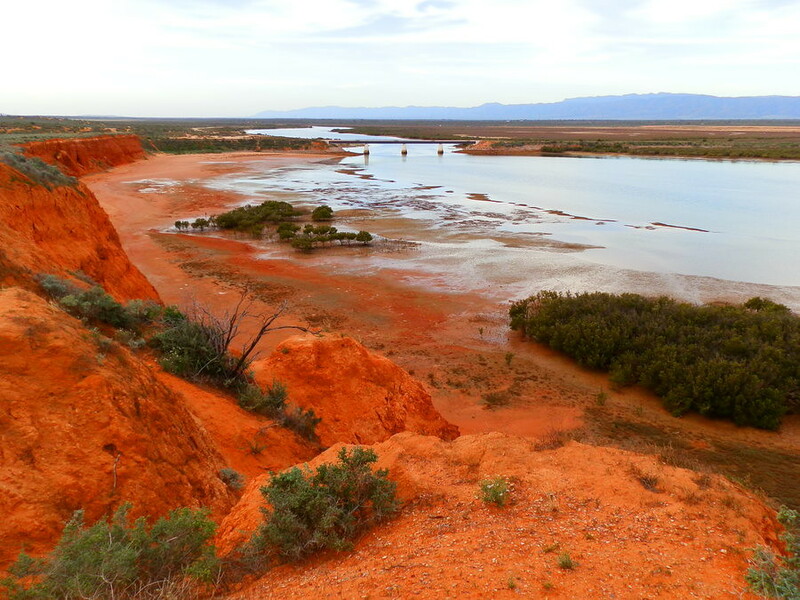 Port Augusta is off the beaten track for many tourists, but it’s the gateway to the Outback! Port Augusta is really packed with exciting experiences. My interest was stimulated by the Time tunnel travel. It would be indeed fascinating to get lost in the annals of time, albeit temporarily. The other experience I would love is train spotting. I have a soft spot for the Railways. The concept of time travel is always intriguin, Sandy N Vyjay – this is your chance to try it out without any space travel risks, haha! And trainspotting is all very well – as long as your accommodation isn’t too close to the tracks! That shunting can go on for hours! Meanwhile in Adelaide there’s been a great idea. Let’s build a nuclear reactor on Aboriginal land at Port Augusta. Right behind their houses, on the edge of town, and a sacred salt lake. It’s insane, Anne. We spent some time in and around Pt Augusta, then in Copley earlier this year and enjoyed the fantastic natural attractions of both areas. This blog post is my small (and possibly meaningless, but I had to do something) way of showing Pt Augusta as a great place to spend a few extra days in instead of driving through. Moving forward and re-inventing itself is what Pt Augusta has done, and can do again – we wish it the best in its journey and will be back to visit again, and hopefully inspire others to do so too. Thank you for your comment. Of course RED is best, Tasha!! I hope you have the chance to see it all for real some day – this is an accessible version of the Aussie Outback, and all the better for being close to the sea! Oh, shoot, Red, we just sped unknowingly through Port Augusta area, both in 1995 and 1999. Missed it all twice how sad is that? Guess this just screams for another visit! Haha, a LOT of visitors just pass through, Iris!! Back in the 90’s some of the tourist attractions might not have been so well developed, anyway. But you’ll know what to do next time you’re there, right?!?!?! Red, are you on the tourist council for Port Augusta? If not, you should be. I particularly liked the triple, toilet teaser at the end. Seriously though, would love to get down this way again and see it properly, the wildflowers/scenery looks amazing. 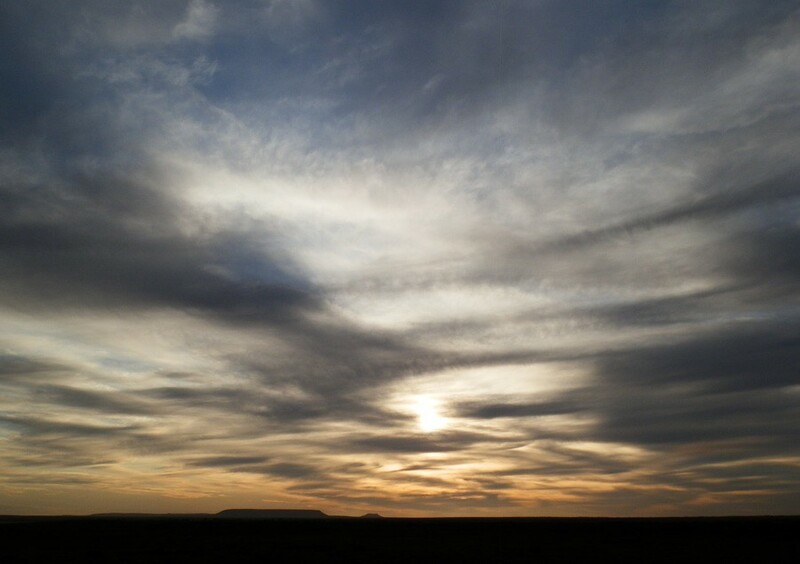 I was surprised at all the fun things to do and see in Port Augusta. We were there for a few days and saw all those great places. There was more water in the gulf though. Our favourite was the Pichi Richi train ride. 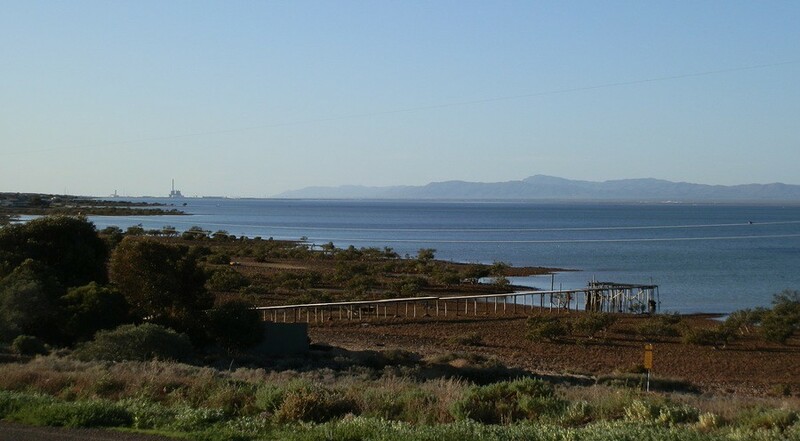 I’ve been to Port Augusta, to the beach when I was a child, we went with another family; in more recent years I was there again, but missed all the scenery, I was visiting my dad in his last days at the hospital. It isn’t a place I’ve ever wanted to go back to. I was surprised at the variety of things to do and the superb natural attractions, River. I’m sorry it doesn’t have happy memories for you from your last visit. I’m just trying to show that there’s more to it now than just a fuel stop en route to somewhere else. Have a great weekend, my friend. We have been here twice. 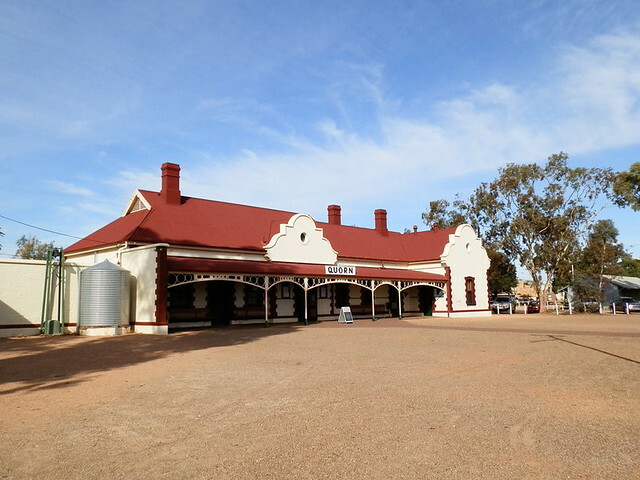 Once we got off the Ghan train enroute to Darwin and we had a walk around the town. But last time we sailed straight through Port Augusta. Maybe it was worth a closer look. Love the red cliffs and the Flinders Ranges are a majestic backdrop. Travelling right through is what many people do, Kathy, but we found it really worth a longer stop on the two times we’ve stayed over. Of course it depends what you like doing, but it’s got something for (nearly) everyone! Wadlata Outback Centre is fantastic! It’s entertaining and welcoming. I don’t see such a tourist information centre in my country – except my blog – hopefully – so it’s very attractive! I think Wadlata is awesome too, Kozue! It’s one of the best we’ve seen anywhere in OZ (except MY blog, haha) and it gives visitors a real taste of what life was like in the Outback and what to expect when they travel through it! What a beautiful and interesting place. I love old steam railroads, and would definitely take a ride on one. Keep up the excellent work, Red. Hi TFG! I’ve been on the Pichi Richi a couple of times – part of the appeal is imagining the difficulties in laying down the line through inhospitable (but spectacular) countryside in the first place!! Another part of the appeal is the steam itself! Modern trains just aren’t the same! !